I always prefer to cook with chicken thigh fillets rather than the breast when stir-frying because their thin layer of fat promotes tenderness and moisture. The addition of asparagus spears adds texture, colour and a vegetable component to the dish. 1. Combine marinade ingredients in a large bowl, add the chicken and toss to coat. Cover, and leave to marinate in the refrigerator for 30 minutes. 2. Wash asparagus and trim woody ends. Peel lower parts of the stems, if necessary, and finely slice on the diagonal. Set aside. 3. Heat 2 tablespoons of the oil in a wok until the surface seems to shimmer slightly. Add half the marinated chicken and stir-fry for 1 minute. Remove from the wok with a slotted spoon and set aside. Add the remaining chicken and stir-fry for 1 minute, remove from the wok and set aside. 4. Add the remaining oil to the hot wok, stir in asparagus, spring onions and ginger and stir-fry for 1 minute. Return chicken to the wok, add wine or sherry and stir-fry for 30 seconds. Lastly, add water, soy sauce or tamari, sugar and sesame oil and stir-fry for a further minute or until chicken is slightly browned and just cooked through. 5. 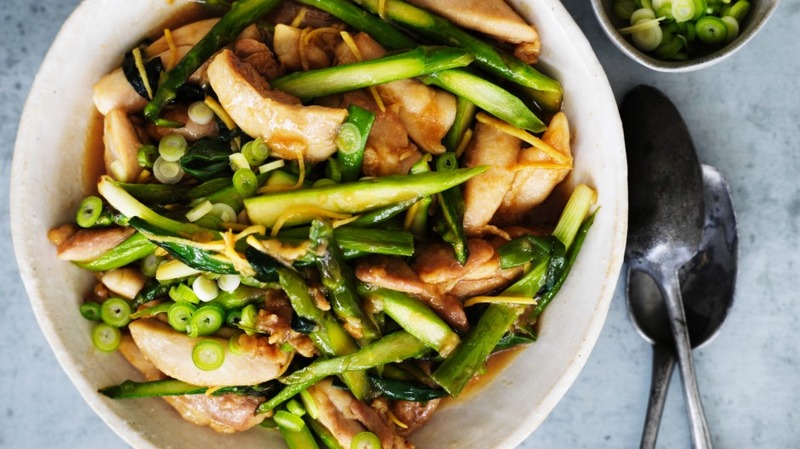 Arrange chicken on a platter and top with finely sliced spring onions.